Champion, Best of Show at the 2017 Houston Livestock Show and Rodeo’s annual Rodeo Uncorked! International Wine Competition. We couldn’t be more proud of this GO TEXAN member for making world-class wine right here in the Lone Star State. There are also articles on soap, pizza, candy and wind chimes. In other words, this issue is a great cross-section that highlights the tremendous diversity amongst our GO TEXAN members. We hope you’ll enjoy this issue. Be sure to share it with your friends, and remember, Texas Agriculture Matters! promote one of its varietals. Livestock Show and Rodeo scholarship recipient. Levy, you just need to drink more of it! from her very first customers. “Our first customers gave us the strength to keep going and to keep perfecting our frozen pizza until we got it to where it is today,” Jamie said. “I owe them many, many thanks. Over the course of taking on and growing our business, I have learned this is what I was meant to do. This is my passion and my purpose.” For more information on Bola Pizza, visit their website. class windchime that he could fine tune to symphonic-quality tonal accuracy. The hand-crafted results were stunning, and in just a couple years, the small company was not only selling chimes at craft shows but wholesaling as well. Over the years, Roark took his concepts to new levels, perfecting a wide array of pitch ranges and even musical scales. Roark’s life was tragically cut short by a drunk driver in 2001, but Eskew carries on his legacy as the president and CEO. The company chimes not only sound wonderful, but they look beautiful as well, combining a minimalist visual aesthetic with hardy materials. “We really feel like Larry’s designs cannot be improved upon,” Eskew said. “We have added one musical scale, the Nashville®, based on the pedal steel guitar, which has been very well received.” For Eskew, the Basso Profundo© chime is her personal favorite. “It has a spectacularly large, deep and sonorous sound,” she said. “It is without parallel, at least to our knowledge.” With years of success under their belt, Music of the Spheres challenges itself to continue to create planet-healing sounds that are soothing to the listener and affordable to all. “In my opinion, the reason musically accurate windchimes create such a peaceful mood for those who listen are that they are literally bio-feedback tools,” Eskew said. “When one hears the harmonious sounds, shoulders relax and forehead wrinkles relax.” One of the rewards the company enjoys is hearing reports from satisfied customers. Many customers offer unsolicited testimonials about the effect their chimes have on folks, particularly the bereaved, the injured, new babies and kids. “One of my favorite letters came written in a very shaky hand from a social security recipient,” Eskew said. “It said something like, ‘I have been saving a little out of my social security check every month for a whole year to buy your soprano (smallest) chime, and I just got it and hung it. It is already the best money I have spent all year.’” For more information on Music of the Spheres, visit their website. could “render” for use in her soap as described in the book. Tallow is grass fed beef fat, and rendering it smelled so badly that her son and husband begged her to stop. In response, Melanie began working with different soap recipes that she found from books and online resources — and started developing other, more natural and vegan products. Her family was much happier with the results. Soon, she began formulating her own personalized recipes. Gifts, they sell to walk-in customers, as well as make the products and ship private label candles to far-away locales like New Zealand, Australia and Canada, and surf shops along the California coast. For more information on Serenity Soapworks, visit their website. RECIPE: GRILLED TEXAS ONION DIP Try this delicious onion dip that celebrates our own Texas sweet onions, which just became in season here in the Lone Star State. cover and refrigerate for at least an hour to allow flavors to blend. 5. When ready to serve, trim and peel the second onion. Using a melon baller, or a sharp-edged spoon, carefully remove the center of the onion, leaving only the outer layers as a shell. Use the center of the onion for another purpose. 6. Spoon the prepared dip into the ‘onion bowl,’ and serve with fresh veggies for dipping. Enjoy! 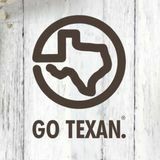 UPCOMING TEXAS EVENTS March 7-26: Houston Livestock Show and Rodeo, Houston March 8-19: Rio Grande Valley Livestock Show & Rodeo, Mercedes March 11-25: Rodeo Austin, Austin March 31 - April 1: American Chuck Wagon Association National Championship Cookoff, Fredericksburg March 31 - April 2: Cattle Raisers Convention, San Antonio March 31 - April 16: Wine & Wildflower Trail, Texas Hill Country wineries April 8: Bluebonnet Tractor Ride, roads in Gillespie County April 28-29: Granbury Wine Walk, Granbury View more Texas events here. 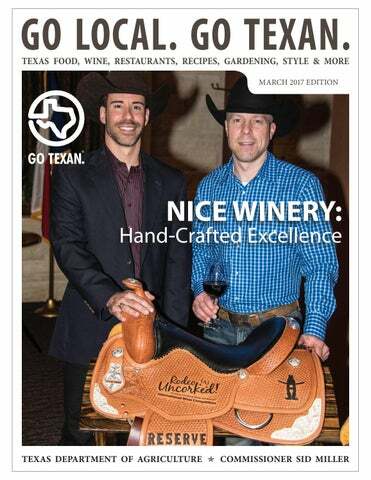 The latest issue, showcasing Texas food, wine, restaurants, recipes, gardening, style and more.